Docklands to Canary Warf, take the Picadilly line to Tower Hill, wander around and blend into the crowd at the Tower of London, exit the main gate and return to the underground, make systematic changes across the city. Once you arrive above ground, walk to a nearby square, wait in the north corner adjacent to the bike parking. A man will hand you a package. Or as my daughter said, ” you’re going to meet a stranger, a man you met over the internet, in a foreign city, in a park”!! At least I know she is receiving my fatherly advice…..and reflecting it upon me in my own quest for a couple of saws. A couple of months ago I realized that I would be in London for a few days. I saw this as the perfect opportunity to look for hand saws. Scrolling through eBay, websites, “car boot sales”, I began looking for a dovetail and tenon saw. I soon realized that to make this work, I would need to find someone that had already been to the estate sales and was reselling the tools, I came across a site called Hackney Tools. 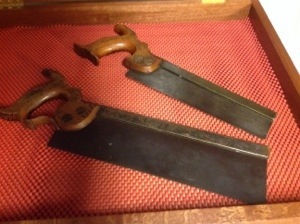 A couple of months ago, I purchased two R. Groves and sons saws and Gary held on to them until I arrived in London. Gary of Hackney Tools met me in the park saws in hand, with a happy smile on his face. We talked briefly and with a shake of hands, I pushed the saws into my backpack, Gary strolled back to work, forgetting that a picture would be great on each of our blogs. I headed back to the underground wondering how airport security would look upon a couple a saws…. Glad to be of service, Richard, and lovely to meet you and your family. I am at the disposal of anyone else who needs English tools for postage, or if they would like to meet in London. Good luck with the saws! Richard, what a great story. The UK is known for quality backsaws, and picking up your very own in London is a great adventure. I was there last October on business. I would love to have gotten some backsaws but didn’t think to check with local tool dealers. Instead, I picked up a set of chisels Paul Sellers had blogged about the week before at Aldi. For seven pounds, I’ve more than gotten my money’s worth. I look forward to seeing your new saws in future project posts.